Operation SAFEE Flight is dedicated to helping children stay in school, improve their academic performance and explore STEM education and career possibilities in the aviation industry. For the ACE camps we have joined up with seven educational partners. Our partners this year are Miami Dade College, Florida Memorial University, George T. Baker, I-Tech, Broward College, Emery-Riddle University and Miramar SHS. Each camp will vary in length between three to five days. Each organization has developed their specialized aviation related curriculum. Each camp will include opportunities to interact with industry professionals, take aviation industry tours and each youth would have the opportunity to take a Discovery Flight. For the Academies we partner with three cities (Doral, Miami Lakes and Opa-Locka) and the Miami Dolphins Community Service Academy). The academy is two days of STEM activities for each city which is one day for the youth to interact with Aviation Professionals, experience Flight Simulators, NASA Smart Skies training and other STEM educational activities. On day two each city selects youth to experience a day at the airport. 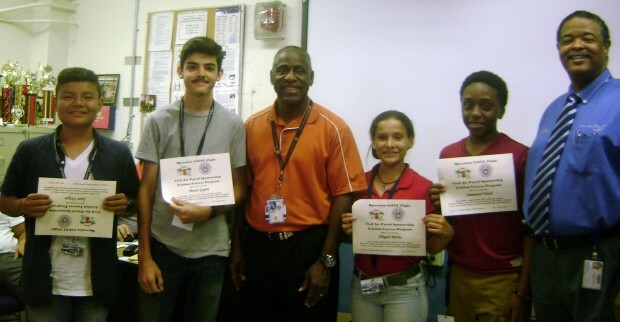 The youth selected by the city will have opportunity to tour the Opa-Locka Airport Traffic Control Tower and the USCG Facilities. They also will take a Discovery Flight that is conducted by Flight schools that partner with SAFEE. I want to thank you for the opportunity given to my son, Alexander M. Martinez, to attend the Safee ACE Camp this summer; he has not stopped talking about it. It is so wonderful to hear him talk about the different areas of aviation and to see the impact the “etiquette” part of the class had on him and his confidence. I am ever so grateful to all the professionals that took the time to share their experience and to impact the lives of these children in such a positive manner. May God continue to bless each and every one of you with the continued ability to touch children’s lives. The Camp is range from a three to six days camp in length. Aviation professionals take part in the camp is multiple areas. We educate the youth of career opportunities and take field trips to airports and within the aviation industry. The students apply practical real life application, work on skills development and practice on Flight Sims and NASA Smart Skies Interactive programs. At the end of the camp the youth take advantage of Discovery Flights. Tuesday – SAFEE brings Aviation professionals to the city with Flight Sims and NASA Smart Skies Interactive programs. Thursday – SAFEE team takes 20-30 youth selected by the city to Opa-Locka Airport to tour the OPF ATCT, and the USCG base. The youth also take Discovery Flights to experience the thrill of flying an airplane.